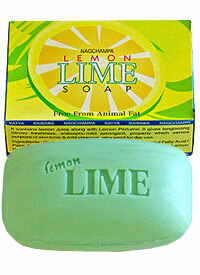 Nag Champa Lemon Lime soap contains Lemon Juice, Lime Oil and natural lemon fragrance. It gives long-lasting citrusy freshness and an antiseptic-mild astringent property which serves as a skin tonic and mild cleanser. This soap is excellent for everyday use.